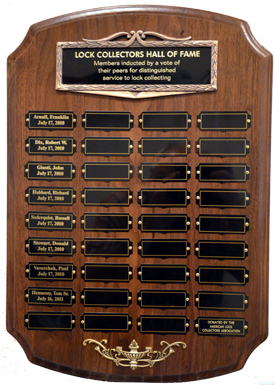 The purpose of the Lock Collectors Hall of Fame is to preserve the history of the hobby, and to give recognition to those who made it the success it is today. The lock collecting hobby is built on the vast history locks. There is much to be learned from the people who have devised and built locks... from the first ancient person to form a device to keep intruders out, to the modern day business person whose company mass produces locks for today's marketplace. The primary venue for lock collectors to meet and share information is lock shows. There are four shows in the USA each year, one in Europe, and one in China (if you know of any others, please inform the webmaster). The people who are inducted into the Hall of Fame are those who left their mark on the hobby by their contributions. These are people who dedicated much of their lives to historical research in their individual areas of expertise. Their common character trait is their willingness to share what they have learned with the lock collecting community making it more knowledgeable as a whole. While most of the inductees into the Lock Collector Hall of Fame have amassed sizeable collections, this is not a factor in consideration of eligibility to be nominated. The lock collecting hobby encompasses collectors of all levels of financial status, all ages, from children to retired locksmiths who have lived with locks for many decades. Some lock collectors prefer to keep their hobby close, only sharing their interest with a few confidants while others like to share their collections and knowledge freely with others.